1-CD with 20-page booklet, 28 tracks. Playing time approx. 74 mns. Broken Heart With Alimony, Bow My Back, Go Stop Go, Meadowlark Boogie or One Day After Payday. Reissued from the master tapes for the first time with photos from Buck's personal collection! Still another Okie, though he was born in Corsicana, Texas, Albert 'Buck' Griffin was a regular on the 'Jamboree'for a time during 1955. Formerly an oil field worker, among other things, Griffin had starred on radio in Oklahoma City under the name Chuck Wyman for several years before signing to Joe Leonard's fledgling Gainesville, Texas-based Lin Records in 1954. 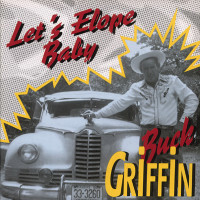 In addition to featuring him extensively in a box set celebrating the legacy of Lin and Kliff Records (BCD 15950), Bear Family has devoted a full-CD to Griffin's fantastic and varied recordings from this period (Let's Elope Baby, BCD 15811), which run the gamut from straight country to Western swing to rockabilly, all of it imbued with the wonderfully visceral bluesy, gospel flavor. Like most of Griffin's output, Let's Elope Baby was written by the singer himself. It was cut at Jim Beck's Studio in the spring of 1955 with a crack studio group that included electric guitarist/mandolinist Paul Buskirk, pianist Bill Simmons and the underrated steel guitarist Bob Meadows. The female backing vocalist is Lou Dressler. Let's Elope Baby was later recorded by Janis Martin. Griffin is a textbook case of someone who deserved far more success than he achieved. His active career was over by 1963, however. He did live long enough to see his legacy celebrated, dying just short of his 86th birthday, in 2009. Customer evaluation for "Let's Elope Baby"
Ich hatte vor allem nach "It Don't Make No Never Mind" gesucht, nachdem ich witzigerweise kürzlich eine Aufnahme von Woody Allen's Klarinettenspiel im Radio gehört hatte und mich an diesen Griffin-Song erinnert sah - und dann diese CD gefunden. Den Song kenne ich seit 35 Jahren und bin auch vertraut mit den anderen Highlights von Buck Griffin. Allerdings war alles immer nur auf alten Cassetten zu hören oder (nicht besser) teilweise auf youtube oder spotify. Die Klangqualität dieser CD ist wirklich hervorragend - und ich bin selbst Toningenieur. Chapeau! Ich bin stolz bei euch sehr gute Qualität zu bekommen. Was ich nur nicht hinbekomme ist das mit den Punkten. Also macht nur weiter so und ich wünsche frohe Festtage euerm ganzen Team.